Police have issued an e-fit of a man they want to trace after a 20-year-old was assaulted in Ipswich town centre. The attack happened in Carr Street when the male victim and two female friends were chatting while they walked through town on Sunday. Two men passed them and one spat water from a bottle over the victim. The victim asked why he had done this and was punched in the face by the man and the other man joined in. The victim suffered a broken jaw. He was treated at Ipswich Hospital and is now recovering at home. 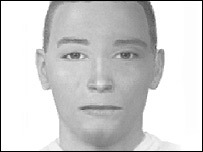 Police released an e-fit likeness of the alleged first attacker who is described by police as of "mixed race", about 16 to 18 years, 6ft tall, of slim build, with an oval face. He was wearing baggy white or a light blue t-shirt, baggy trousers/jogging bottoms and light coloured trainers. Suffolk Police said there was no e-fit of the second man who is described as about 18-years-old, about 5ft 8in to 5ft 9in tall, and wearing a black peaked cap and dark blue jeans. Anyone with information is asked to call Suffolk Police.